Professor Hammer has been on the faculty at Wayne State University Law School since 2003, and currently serves as the director of the Damon J. Keith Center for Civil Rights. 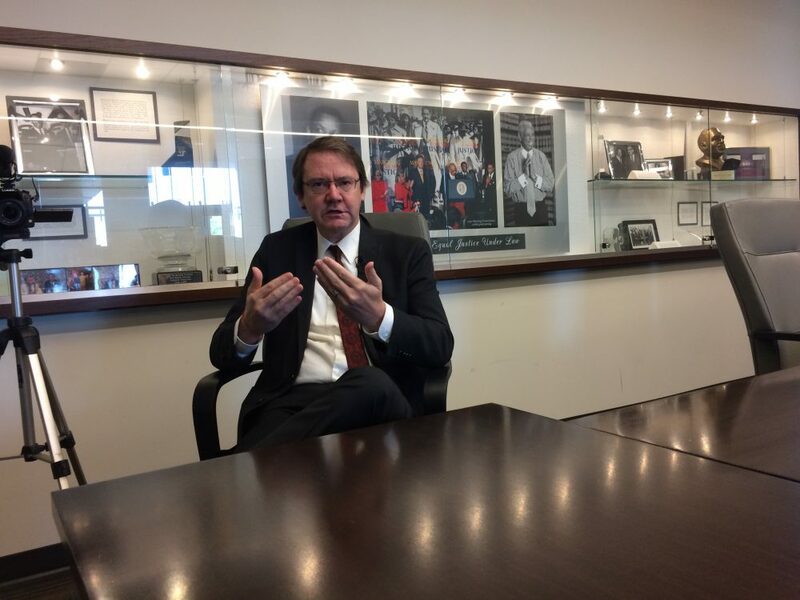 He sat down with the Michigan Chronicle recently for a discussion on the intersection between race relations and justice in Southeast Michigan. How do you feel justice is being administered here in Detroit? So if you ask me about police brutality and the current conflicts going on, I think what’s interesting to note is the similarities between the late 1960s and today. And the realization that if you believe, as I do, that structural racism is our generation’s civil rights challenge, that we’ve made almost no progress on structural racism, or the inner cities in the last 50 years. The important strides in the first civil rights movement were focused largely on the south, and largely institutions of Jim Crow segregation. While Jim Crow was being set up in the South, we were setting up in the North and in western cities systems of special racism. The sort of saying that in the South you can be close in social relations but you can’t be equal. In the North, you can be equal but you cannot be close. So we have residential segregation, and economic segregation, and the segregation of wealth in the north has been the key factor. We haven’t addressed any of that. So when I see this civil unrest, I see this kind of militarization of police forces. I see the kind of implicit bias within the police officers that are immediately projecting notions of hostility and notions of violence. When you talk about unhealed spatial racism, what are you saying? If you talk about the unhealed racial divides that exist, particularly in the north, and particularly as defined by geography, the example I use when I’m speaking or teaching is something that people saw as a huge puzzle or contradiction in the 1960s; you had the passage and the signing of the Civil Rights Act of 1965. And then two days later you had the Watts riots. I see those two as completely consistent, because the Civil Rights Act was going at social segregation, and Jim Crow segregation in the south. And at the same time, the problems of the north were not being healed. So you have that kind of interesting [occurrence], within two days an explosion of violence as the result of special racism and racial segregation that exists geographically in the west and the north, and remembering the next summer when King went to Cicero, Illinois and the complete violence of the protests. …We’ve really dropped the ball. We haven’t addresses those problems that were ripe in the late 1960s and you can draw a direct line. And I think we’re remembering that now on the remembrance of the 1967 Rebellion is on the horizon, that those problems still exist. Structural racism, what does that mean? The inter institutional dynamics of how the police system works with the education system, with the transportation system, with the jobs system, with the health system to produce and reproduce racially disparate outcomes over time. You’re born in this zip code and you’re not born in that zip code and that makes a difference for 25 years of your life. So what produces and what reproduces that difference? Look at wealth disparities. So that the average European American has 10-12 times greater wealth than the average African American household. What produces and what reproduces that over time? That is structural racism. When I say that structural racism is this generation’s civil rights challenge, what I’m saying is we’ve got to stare in the face of the existence of tremendous data-driven racial inequities and get to the notion of how those are produced by these complex interrelations between education and housing and health and opportunity, and day if we’re really gonna have equal justice under law, we really ought to have equal opportunity for everybody no matter what zip code they’re born into. How are you seeing that playing out in Detroit? We’re at ground zero of structural racism and special racism in Southeast Michigan. And sometimes I say that we’re the new Selma, and if we don’t recognize that and if we don’t rally to that, and call things by their true names? So what’s incredibly disturbing to me is people are talking about this renaissance of Detroit, the restructuring, the resurrection of Detroit. You look at the major documents underlying that, going back to Detroit Future City, looking at the blight removal task force report, looking at the bankruptcy plan of adjustment, those are completely acontextual. They’re looking at the issues and challenges of Detroit economically in complete isolation from our history. If you’re not addressing the root causes, there’s no chance of having a success. And then people kind of throw up their hands in surprise that there’s a tale of two cities emerging. That in 7.2 miles where there’s tremendous investment going on, largely public subsidized, we’re actually increasing the economic divides. …All of these things are coalescing in Detroit in ways that are probably more serious than anywhere else in the country. And yet we’re celebrating the fact that we have an M-1 lightrail that resolves the contradictions of the PeopleMover that went around in a circle and now just goes back and forth along a straight line for almost the exact same distance. Is there a sense of denial among the powers that be related to where we really are vs. where they’d like to think we are? One of the things that really bothers me is this sort of complete Balkanization of the region. So people can now structure their lives. There’s actually probably less social interaction along racial lines today than there was 50 years ago or 60 years ago. Because we’ve been able to structure our lives. I can go in my little circle here, and never have to come to Detroit. And when I do come to Detroit I know what I’m doing; I’m going to a football game, I’m going to a baseball game, I’m going to the DIA. I’m listening to the opera. I come in on an expressway and I park in a secured parking garage and then I go out on an expressway without any interaction with other people. Things have a façade of getting better, but the deep roots of where the problems are are not being addressed. What are your views on the literacy lawsuit being brought by students and parents? People might look at that and say ‘well that’s not a good lawsuit then’. I flip that on its head and say ‘look how bad the law has evolved’. Where the law has no remedy for structural racism. What we have now is an interpretation and an understanding of law that can’t even begin to deal with the depth of issues of race and racism in our country. Particularly as they’re represented by structural racism and implicit bias. Think about the thing that the law does care about. The law cares about express intentional forms of state discrimination, right? Then think about what we’re learning in the last 25 years about implicit bias. It says that each of us, as a result of the society that we live in, with our history, with our media messaging, with our dysfunctional social relations, have notions of social bias reinforced in us all the time. If that’s the case, if implicit bias really exists, then intent is not a stable category. So if I take implicit bias seriously, then the entire legal construct, which is on intent of the complete conscious mind unaffected by anything else is a meaningless category. It’s not rocket science. The lived experience of most people in Detroit know all of this. You don’t need a professor to tell you that racism is real and it impacts the geography and the life of people in the region. In the same way, you don’t need to be a rocket scientist to realize you could change all of constitutional law with one small change; if you move from an intent standard to a disparate impact standard, which says we’re going to judge state action by its outcomes, then a state policy leads to rampant disparate impacts where the rate of literacy is radically different from one group to another. The rate of diabetes or chronic illness or life expectancy is radically different than another. If the ability to accumulate wealth over a 75-year period is different from one group to another, then there’s something wrong. And that is the standard that is used internationally and in other countries. How does implicit bias play out in Detroit with more black police officers and what Coleman Young did? The police culture matters more than the police color. Changing the blue culture, regardless of the color of the person having the uniform that is the real challenge. [For example], you’re telling me now that I have a black police chief, and in many respects that’s laudable. That’s significant. But it’s not enough. Because they’re coming from the same society. They’re subject to the same kind of pressures that create these unconscious categories. And furthermore, within the police mentality, they’re likely to be reinforcement heightened. So unless you’re consciously trying to interrupt on the way in which police are trained, the incentive structure of how they operate, how they’re rewarded and what they’re rewarded for, then changing the color doesn’t change enough. And you still have the root causes again that are not being addressed simply by diversifying a police force. What’s the relationship between poverty and justice? Poverty is violence. If people are living in poverty, it’s really the absence of opportunity. And there’s another dynamic that happens every day in Detroit and Southeast Michigan; and this is coming straight out of a graphic from Detroit Future City, as I recall the graphic, it says that 70 percent of the jobs in Detroit are held by people from the suburbs. And those are the better jobs. So everyday people wake up in their homes in the suburbs, get in their cars, and come into Detroit, park in a secured parking lot, go into the high rise buildings, and make a good living in Detroit. 60 percent of the people who have jobs in Detroit are working outside of Detroit. Which means that they wake up in Detroit – we know that a huge percentage of people don’t even have access to a car. So they have to go to a completely dysfunctional system of public transportation to try to get connection to connection to get to their job on time. And they’ll be punished if they don’t. Not because they didn’t wake up early enough but because the regional transportation system can’t get them to the job they need. And those jobs are not the same high-quality jobs that the white suburbanites are taking. You can’t have a just, healthy society that’s predicated on that level of inequality.